Medium: Spray paint, refrigerator, a bit of wood, and a bunch of screws. Process by which you created this: After coming across an old refrigerator in the desert, I hauled it home in hopes of being able to salvage enough of the exterior to make a interesting canvas. I cut the exterior of the fridge into usable tiles and then rattle-canned them with a stencil that I had hand cut. Background: I had originally made the piece for an annual bicycle art show that was hosted by a good friend, Brent Hulme, at the Salt Lake City Bicycle Company. 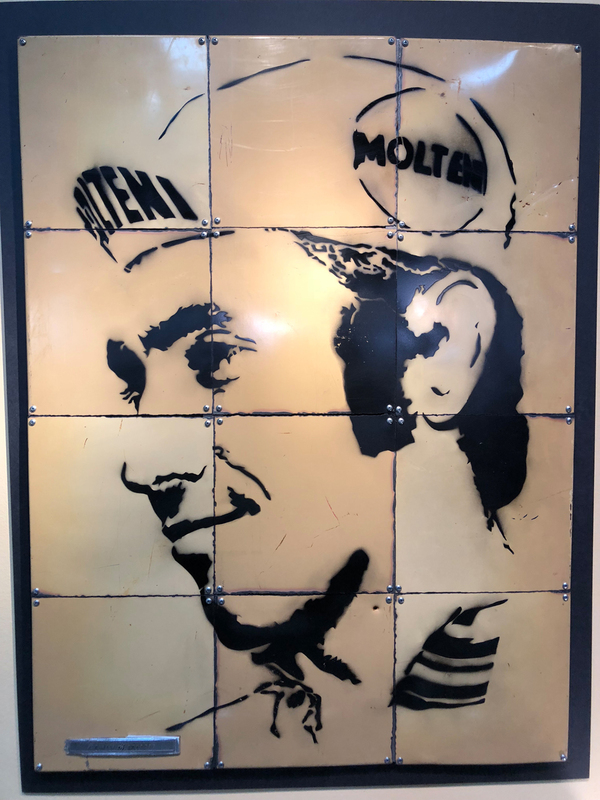 He'd had asked if I wanted to display anything – and so I whipped up the portrait of Merckx. I had no intention of selling it, and when it sold, the mrs. was kind of sad that the it wasn't coming back home. I ended up buying her a weed eater with the cash from the sale. Where can people find your art? I tinker and dabble in my shop, but rarely do my creations make me any money. That's what day jobs are for. Most of the items created in my shop are purpose built, one-off creations aimed at fulfilling a need, while maintaining some sort of flair. I tend to overdo things. Generally, the satisfaction that I get out of a project is had at about 2:00 am in my shop when whatever I am working on is finally completed, my shop is a complete wreck, and I catch myself giving whatever it is that I have built the thousand yard stare. You can find my “art” at every corner of my shop, my home, and in the hands of my friends and family. Furniture, doors, custom engine carriers, bicycles, you name it – they are strewn about. Many of them are used and loved, some are in a pile waiting for another chance at becoming something good. Are you still building bikes? Tell us about them: I am still building bikes, but at a snails pace – and mostly for friends and family. Extra time is becoming a precious commodity around my shop, and I find myself leaning towards spending time with my lovely bride and my youngster rather than filing my life away. I imagine that I will always be building bikes, but right now – I have other priorities. Where can people find more information on this? I post somewhat regularly on Instagram (jrusshanson). If you are interested in being inundated by photos of Volkswagens, feel free to have a looksee. I have tens of followers.